I don't get truly surprised too often anymore after 13-plus years in this gig, but when I clicked the link for this Washington Post article, "DC Unveils Plans for New Frederick Douglass Bridge," I most certainly did not expect to see a completely new design of the bridge that has been on the boards to be replaced for well over a decade. The plans for building the new bridge immediately south of and parallel to the old bridge have not changed, and there will still be large traffic ovals on both ends. A $441 million design-build contract has been awarded to a joint venture of Archer Western Construction and Granite Construction Company, and AECOM is the lead designer. This phase also includes the reconstruction of the interchange of Interstate 295 and the Suitland Parkway. The Post article says that the new bridge is "projected to open in 2021." Here's a few more graphics purloined from the Post piece--hopefully DDOT will post their video of the design soon and I'll add the link. It'll take me a little while to update my South Capitol Street Bridge project page, but in the meanwhile it's a nice trip down memory lane and includes more information (current as of the last time the city announced information about the project) about the ovals and whatnot. And my South Capitol Street project page explains how this bridge and the interchange project are the first of a multiphase plan to rework much of South Capitol from the Southeast Freeway to the Suitland Park. UPDATE: There is a new URL for an official web site for the project, newfrederickdouglassbridge.com. You can see the rendering video by scrolling down a touch or clicking on "Gallery." There's a lot of additional drawings, including these two from above, which show the traffic ovals and also do show multi-use paths on both sides of the bridge. See also the siteplan to get your bearings about the new bridge and ovals and 295 interchange. Also, the project web site says that construction is expected to begin in "winter 2017." Wow, that is so beautiful (the bridge). holy crap, that's gonna be cool. Just to be fair, $900 M was probably for the entire South Capitol Street reconstruction project, not just the bridge. Though originally the bridge was priced at more than $600 million, back when it was still going to need to have a swing span. Be sure to watch the video on the project web site. Wow, this is very impressive. Frederick Douglass is doing great work. He is being recognized more and more these days. Looks good but where will the zip-line going across the Anacostia be placed? Over on that other bridge, you know, the one that always seems to be a year away from getting started. This looks great but I give it about two days before the U.S. Commission of Fine Arts tries its best to make this bridge dull. Also, it reminds me of the 6th Street viaduct replacement in LA. It almost makes up for some of the pain of losing the Barry. Dock 79 residents are sure going to have a much improved view. What, what a beauty at night! Also, the new DC Water & Sewer Authority headquarters will compliment this new modern bridge design. 202_cyclist: I hope D.C. isn't jumping the gun on naming the bridge after this Mr. Douglass guy. Wouldn't it be better to wait a few decades until he retires and we can put his accomplishments into perspective? Totally agree that the renderings of the bridge are pretty solid. Hopefully the finished product looks like that! I also like that the design seems to limit the amount of dead space around the ends of the bridge to the greatest extent possible. Why so much noise? STFU and go back to sleep! In other news, Ann's appears to be open today. When I saw the bridge design in my email the other day I was pleasantly surprised. The whole profject looks good and seems to make sense. Very cool. One question about the design of the bridge-- presumably the vertical arches won't pose a hazard to the many low-flying helicopters in the area, especially with the heliport in Buzzard Point on the other side of So. Capitol Street (will this be relocated with the coming development of that part of Ward 6?). Has DDOT studied this? Wow, swore we discussed it here in the comments, but guess it was just on Twitter. I always think about what the bridge will look like in a drought. Some bridges lose all of their aesthetic value when the river dries up. We probably don't have to worry about that though. It looks beautiful as shown. Unfortunate news regarding Il Parco. If I had some money to invest, I would buy property along the lower 8th Street corridor. 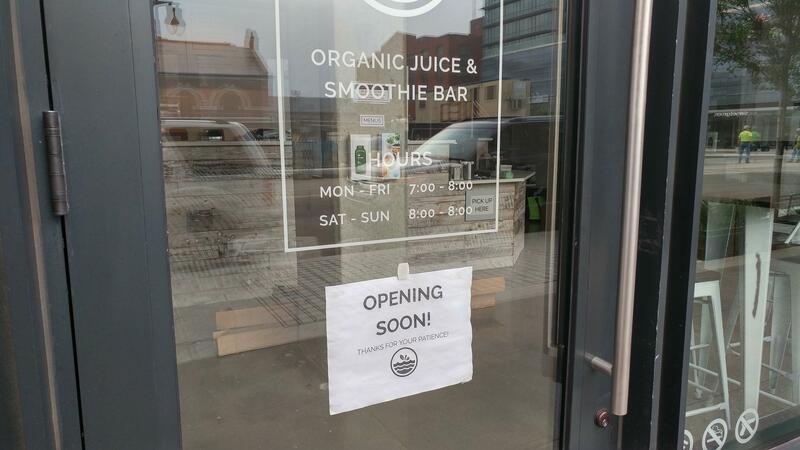 Paper is down at Juice Laundry and there's a sign on the door. Does anyone know the status of construction at the Zika pit known as the second phase of Parc Riverside. I haven't seen any apparent activity there in about two weeks. I agree with what others posted about Il Parco. The pizza was actually quite good but the service was lacking. A tower crane is being installed today at the West Half Street site. See, @202, I told you to be on the lookout! I have to say, these are exciting times we're living in!